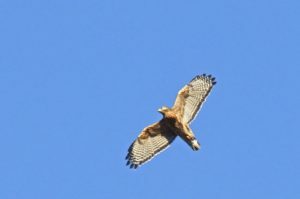 Last summer I had a pair of red-shouldered hawks in the woods out back. Every morning they would come up from the creek and circle with their repetitive cry. They are back this year, calling to each other. I have been practicing with my long lens and caught these pictures on February 24. I could hear them during the blizzard on March 14 and am wondering how they fared.